This article is about the city of Albany. For the local government area, see City of Albany. Albany Entertainment Centre, opened December 2010. Albany /ˈælbəni/ is a port city in the Great Southern region of Western Australia, 418 km SE of Perth, the state capital. Albany is the oldest colonial settlement in Western Australia, predating Perth and Fremantle by over two years. The city centre is at the northern edge of Princess Royal Harbour, which is a part of King George Sound. The central business district is bounded by Mount Clarence to the east and Mount Melville to the west. The city is in the local government area of the City of Albany. The Albany settlement was founded on 26 December 1826, as a military outpost of New South Wales as part of a plan to forestall French ambitions in the region. To that end, on 21 January 1827, the commander of the outpost, Major Edmund Lockyer, formally took possession of the western third of the continent for the British Crown. The settlement was initially named Frederick Town in honour of Prince Frederick, Duke of York and Albany. In 1831, the settlement was transferred to the control of the Swan River Colony and renamed Albany by Lieutenant-Governor James Stirling. During the last decade of the 19th century the town served as a gateway to the Eastern Goldfields. 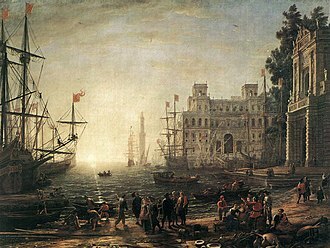 For many years, it was the colony's only deep-water port, having a place of eminence on shipping services between Britain and its Australian colonies. The opening of the Fremantle Inner Harbour in 1897, however, saw its importance as a port decline, after which the town's industries turned primarily to agriculture, timber and later, whaling. Today as a city it is the southern terminus for tourism in the region, and the state's South West, which is known for its natural environment and preservation of heritage. The town has a role in the ANZAC legend, being the last port of call for troopships departing Australia in the First World War. Also an auxiliary submarine base for the US Navy's 7th Fleet was developed during the Second World War in the event the submarine base at Fremantle was lost. Also in the harbour was an RAN Naval Installation which provided for alongside refuelling from four 5000 ton fuel tanks. Kinjarling (Albany) was home to Menang Noongar indigenous tribes during the summer season. They called the area Kinjarling which means "the place of rain". 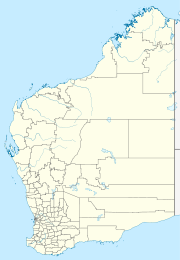 Many town names in South-Western Australia end in "up" or "ing", which means "place of" in the Noongar language. They would sometimes camp near "Boondie Yokine" – roughly translated as Dog Rock. Early European explorers discovered evidence of fish traps located on Emu Point and on the French, now the Kalgan, River. Vancouver made attempts to find the inhabitants of the area but only found bark dwellings that were unoccupied. Later explorers made contact and were told to leave, but were accepted when they didn't. Most of the exploration was made to survey the land and sea and assess the resources for further exploitation. The explorers only occasionally noted the Noongars they encountered. Native treatment laws and programs have affected the tribes since settlement. The following Information is derived from the State Heritage Register where these places are registered. The assessment criteria contain more details. The Old Farm Strawberry Hill was established in 1827 as a government farm to feed the colonial soldiers stationed around King George's Sound. It is the oldest farm in Western Australia. The homestead, which became the home of the Government Resident in 1836, is an example of a colonial gentleman's residence. After a chequered history the property was vested in the National Trust WA in 1964 and is now a house museum. Patrick Taylor Cottage (1832), Western Australia's oldest surviving dwelling, built in 1832 by the Morley Brothers. It is now maintained by the Albany Historical Society. St John's Church (1841–1848) is a stone building with shingled roofs in the Old Colonial Gothick Picturesque style. Set among trees, it was designed to be part of an overall contrived picturesque scene in the manner of an English garden landscape. Scots Uniting Church (1892) was designed in the Victorian Academic Gothic style by Melbourne architect Evander McIver and built with local granite stonework. The complex now known as The Residency Museum was established in 1850 as a depot for the Convict Establishment in Albany. It is an L shaped, single storied, masonry building with a timber framed, timber shingled roof. In 1873 it was converted into the Resident Magistrate's home. It now serves as a museum. The Victorian Free Classical Revival style Town Hall (1888) is a two-storey stone building with a prominent clock tower, which dominates York Street, the main street of Albany. It has been put to many uses apart from council meetings, including public entertainment and public meetings of all kinds and even as the venue for the first regional meeting of the State Parliament. The Old Post Office was built in two stages, the first was designed in 1869 by J Manning, the second, including a prominent tower, was designed in 1896 by George Temple-Poole. It now houses the Albany campus of the University of Western Australia. The Court House, constructed of Albany brick and granite with a tiled roof, was designed in the Federation Romanesque style by the Public Works Department under the supervision of George Temple Poole and Hillson Beasley in 1897. Another example of the work of George Temple Poole is the limestone and shingle Federation Arts and Crafts style Cottage Hospital, designed in 1886 and completed in 1897. It is one of the oldest hospitals in the state and served as such until 1962. It is now occupied by the Vancouver Arts Centre (named after the explorer George Vancouver). At the 2016 Census, the urban population of Albany was over 33,145 making it the state's sixth-largest population centre. 74.3% of people were born in Australia. The next most common countries of birth were England 7.5%, New Zealand 1.7%, Philippines 1.6%, South Africa 1.1% and Scotland 0.7%. 86.8% of people only spoke English at home. Other languages spoken at home included Filipino 0.7%, Italian 0.6%, Tagalog 0.6%, Afrikaans 0.6% and German 0.4%. The most common responses for religion were No Religion 37.4%, Anglican 16.5% and Catholic 13.1%. The city centre of Albany is located between the hills of Mount Melville and Mount Clarence, which look down into Princess Royal Harbour. Many beaches surround Albany, with Middleton Beach being the closest to the town centre. Other popular beaches include Frenchman Bay and Muttonbird Island. Albany is 418 km (260 mi) SSE of the state capital, Perth, to which it is linked by Albany Highway. Albany is in a sub-region of the Great Southern region of Western Australia. Albany has a Mediterranean climate (Köppen Csb) with dry, warm summers, mild, wet winters, and pleasant springs and autumns. Summers have short spells of very hot weather, but cool ocean breeze brings relief, especially during evenings and nights. The city is situated on what is promoted as the "Rainbow Coast", an appropriate title given the frequency of days with both sun and drizzle or showers. Albany has 44.8 clear days annually. July is the wettest month, with a long-term average of 144.0 mm (5.67 in). Rain in excess of 0.2 mm (0.01 in) occurs on two days out of every three during an average winter. The driest month is February with a mean of 22.9 mm (0.90 in). Albany received a record amount of rain on 20 November 2008 when violent storms swept across the Great Southern region. The town was flooded after 113.8 mm (4.48 in) of rain fell in a 24-hour period, the highest amount recorded since rainfall records began in 1877. The wettest month on record was June 1920 when 292.8 mm (11.5 in) fell, while February 1877 and February 1879 remain the only rainless months. 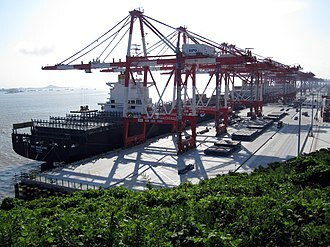 Albany's main industries are tourism, fishing, timber (wood chips) and agriculture. From 1952 to 1978 whaling was a major source of income and employment for the local population. The Whaling Station, which closed operations in 1978, has been converted to a museum of whaling, and features one of the 'Cheynes' whale chasers that were used for whaling in Albany. The station was the last operating whaling station in the southern hemisphere and the English-speaking world at the time of closure. The Western Power Wind Farm is located at Sand Patch, to the west of Albany. The wind farm, originally commissioned in 2001 with 12 turbines, now has 18 turbines, driven by strong southerly winds, and can generate up to 80% of the city's electricity usage. Albany has a number of historical sites including the Museum, Albany Convict Gaol, The Princess Royal Fortress (commonly known as The Forts) and Patrick Taylor Cottage, one of the oldest dwellings in Western Australia, c1832. Albany has a great deal of historical significance to Western Australia. Natural sights along the rugged coastline include the 'Natural Bridge' and the 'Gap'. The beaches have pristine white sand. The destroyer HMAS Perth was sunk in King George Sound in 2001 as a dive wreck. Albany is also close to two low mountain ranges, the Porongurups and Stirling Ranges. Albany is the southern terminus of the Bibbulmun Track walking trail. Albany is the southern terminus of the Munda Biddi Trail off road cycling trail. Albany is home to HMAS Albany (based in Darwin) and the adopted home port of the Royal Australian Navy frigate HMAS Anzac. Albany is frequently visited by other warships. Albany has a city bus service run by Love's Bus Service with five town routes. Albany is connected to Perth with road-coach services via Walpole and Bunbury; via Katanning and Northam; via Kojonup and Williams. Transwa coaches also serve Jerramungup, Ravensthorpe and Hopetoun. Regional Express Airlines, a national independent regional airline, provides 23 services a week between Perth and Albany Airport using 34-passenger turboprop Saab 340 aircraft. Albany was served by the Albany Progress passenger train from Perth until 1978. The railway station reopened as a tourist information centre in 1994. Albany radio stations include 783 Triple M (formerly 6VA and RadioWest), GOLD MX, Rete Italia, Vision FM, Fly FM Albany, HitFM (formerly HOT FM), ABC South Coast, ABC News, ABC Radio National, ABC Classic FM, Triple J, Racing Radio & Albany Community Radio. Below is a table showing the broadcast frequencies on which these services can be received. Localised television stations available in Albany include GWN7, WIN Television Western Australia, West Digital Television, SBS and ABC Television Western Australia. GWN7 broadcasts a half-hour news program for regional WA, GWN7 News, at 5:30pm on weeknights with a district newsroom covering Albany and surrounding areas based in the city. Below is a table showing the full suite of digital television services available in Albany. These services are broadcast from Mount Clarence and cover the majority of the geographic area with some areas requiring signal to be received from the Southern Agricultural site at Mount Barker. Both these transmission sites employ vertical polarity. Furthermore, a number of residents rely on receiving these services via satellite using the Viewer Access Satellite Television (VAST) system. Local newspapers are the Albany Advertiser (established 1888) and The Extra, (owned by Seven West Media Limited, publishers of The West Australian), and The Great Southern Weekender, independently owned by Beaconwood Holdings Pty. Ltd. The Great Southern Weekender also owns local radio stations GOLD MX and Fly FM. Tune in saturday's at 8am to VK6RAL to learn about Amatuer radio/ electronics through ftroop. Tune in sunday's from 8am to 9:30am to VK6RAA or VK6RAL for the 1/2 hour Amateur radio national news service from VK1WIA followed by the VK6WIA wa amateur radio news broadcast. Note you will need an aprropriate scanner to tune in . There are currently several primary schools, eight high schools and one university campus in the Albany area. ^ a b c Australian Bureau of Statistics (27 June 2017). "Albany (Sighicant Urban Area)". 2016 Census QuickStats. Retrieved 5 January 2018. ^ "2011 Census Community Profiles: Albany". ABS Census. Australian Bureau of Statistics. Retrieved 15 September 2016. ^ Battye, James Sykes (1924). Western Australia: A History from Its Discovery to the Inauguration of the Commonwealth. Oxford: Clarendon Press. p. 61. ^ "King George's Sound Settlement". State Records. State Records Authority of New South Wales. Archived from the original on 24 June 2014. Retrieved 14 May 2014. ^ Nind, Isaac Scott (7 February 1828). "View of Frederick Town, King Georges Sound, at the expiration of the first year of its settlement" (pdf). Manuscripts, Oral History and Pictures. State Library of New South Wales. Retrieved 12 May 2014. ^ Nind, Isaac Scott (1832). "Description of the Natives of King George's Sound (Swan River Colony) and Adjoining Country". The Journal of the Royal Geographical Society of London. 1: 12. JSTOR 1797657. Retrieved 12 May 2014. ^ Wilson, Thomas Braidwood (1835). "Formation of the Settlement at King George's Sound". Narrative of a Voyage Round the World. London: Sherwood Gilbert & Piper. p. 281. Retrieved 12 May 2014. ^ West, D.A.P., The Settlement on the Sound – Discovery and settlement of the Albany Region 1791–1831, Western Australian Museum, Perth, 1976, reprinted 2004. pp. 55–115. ^ Hutchison, D., Fremantle Walks, Fremantle Arts Centre Press, Fremantle, 2006, pp. 51–55. ^ "Destination Albany". Retrieved 2017-10-07. ^ Base Facilities Report, Commander US 7th Fleet dated 15 September 1944 p26. ^ a b The Amity Heritage Precinct[permanent dead link] www.museum.wa.gov.au. "Archived copy". Archived from the original on 24 January 2010. Retrieved 2009-12-16. CS1 maint: Archived copy as title (link) Retrieved 3 August 2007. ^ "State Heritage Register". Heritage Council, State Heritage Office. Retrieved 1 November 2015. ^ "Strawberry Hill". National Trust. Canberra, ACT: Australian Council of National Trusts. Retrieved 23 May 2018. ^ James Halliday (2009). The Australian Wine Encyclopedia. Hardie Grant Books. ISBN 978-1-74066-774-6. ^ "PerthNow - Storm dumps record rainfall on Albany". 20 November 2008. Archived from the original on 3 September 2012. Retrieved 24 November 2008. ^ "Climate statistics for Albany". Australian Bureau of Meteorology. Retrieved 23 April 2016. ^ "Climate Statistics for Albany Airport Comparison". 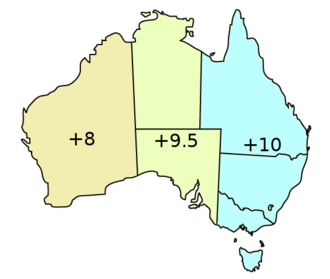 Climate statistics for Australian locations. Bureau of Meteorology. Retrieved 23 April 2016. ^ "Whaling". State Library of Western Australia. Retrieved 3 May 2017. ^ "Albany Wind Farm". Verve Energy. 2013. Archived from the original on 22 November 2013. Retrieved 7 October 2013. ^ Wind Energy in Western Australia Archived 9 March 2008 at the Wayback Machine Jade Carlton, www.sustainability.dpc.wa.gov.au. Retrieved 3 August 2007. ^ "Assessment Documentation - Patrick Taylor Cottage". Register of Heritage Places. Heritage Council of Western Australia. 30 June 2009. Archived from the original (pdf) on 12 May 2014. Retrieved 12 May 2014. ^ Former HMAS Perth Dive Wreck Archived 18 June 2013 at the Wayback Machine www.albany.wa.gov.au. Retrieved 3 August 2007. ^ "Albany Bibbulmun Track". Bibbulmun Track Foundation. Retrieved 2017-10-07. ^ "REX airline to fly to Albany and Esperance". The West Australian. Perth, WA. 22 February 2016. Archived from the original on 10 June 2016. Retrieved 21 May 2016. Arnold, Murray (2015). A Journey Travelled: Aboriginal-European Relations at Albany and the Surrounding Region from first contact to 1926. Crawley, WA: UWA Publishing. ISBN 9781742586632. Wikimedia Commons has media related to Albany, Western Australia. "Albany (Australia)" . New International Encyclopedia. 1905. "Albany" . Encyclopædia Britannica (11th ed.). 1911. "Albany (Australia)" . Encyclopedia Americana. 1920. 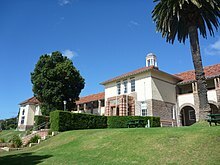 It is the oldest university in the state of Western Australia. It is colloquially known as a sandstone university and it is a member of the Group of Eight. 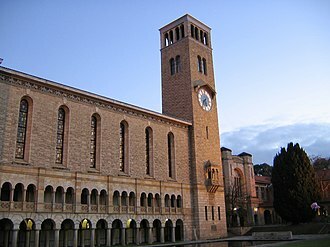 UWA was established under and is governed by the University of Western Australia Act 1911, to date, the university has produced 100 Rhodes Scholars, one Nobel Prize laureate and one Australian Prime Minister. In 2010 UWA joined the Matariki Network of Universities as the youngest member, the university was established in 1911 following the tabling of proposals by a royal commission in September 1910. Irwin Street was known as Tin Pan Alley as many buildings featured corrugated iron roofs and these buildings served as the university campus until 1932, when the campus relocated to its present-day site in Crawley. This allowed the construction of the main buildings, many buildings and landmarks within the university bear his name, including Winthrop Hall and Hackett Hall. In addition, his bequest funded many scholarships, because he did not wish eager students to be deterred from studying because they could not afford to do so. During UWAs first decade there was controversy whether the policy of free education was compatible with high expenditure on professorial chairs. An old student publicised his concern in 1921 that there were 13 faculties serving only 280 students, a remnant of the original buildings survives to this day in the form of the Irwin Street Building, so called after its former location. In the 1930s it was transported to the new campus and served a number of uses till its 1987 restoration, the building has served as the Senate meeting room and is currently in use as a cricket pavilion and office of the university archives. The building has been heritage-listed by both the National Trust and the Australian Heritage Council, UWA is one of the largest landowners in Perth as a result of government and private bequests, and is constantly expanding its infrastructure. Recent developments include the $22 million University Club, opened in June 2005, in addition, in September 2005 UWA opened its $64 million Molecular and Chemical Sciences building as part of a commitment to nurturing and developing high quality research and development. The Great Southern Region is one of the nine regions of Western Australia, as defined by the Regional Development Commissions Act 1993, for the purposes of economic development. It is a section of the larger South Coast of Western Australia, the region officially comprises the local government areas of Albany, Broomehill-Tambellup, Denmark, Jerramungup, Kent, Kojonup and Woodanilling. The Great Southern Region has an area of 39,007 square kilometres and its administrative centre is the historic port of Albany. It has a Mediterranean climate, with hot, dry summers and cool, the economy of the Great Southern Region is dominated by livestock farming and crop-growing. It has some of the most productive cereal grain and pastoral land in the state, Albany is a major fishing centre. The coast of the Great Southern Region has milder weather than areas on the west coast proper and is a popular destination for holidaymakers, tourists. Noongar people have inhabited the region for tens of thousands of years, European settlement began with the establishment of a temporary British military base, commanded by Major Edmund Lockyer, at King George Sound on Christmas Day,1826. Mount Clarence is an inner suburb of Albany, Western Australia, between the Albany city centre and Middleton Beach. 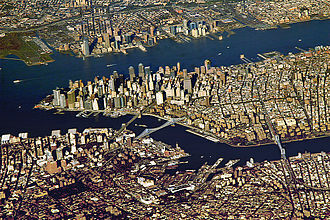 Its local government area is the City of Albany, and over three-quarters of its area is either parkland or forest. Mount Clarence was gazetted as a suburb in 1979, Mount Clarence is bounded by Middleton Road to the north, Marine Drive to the east and south and the eastern boundary of Albanys town centre to the west. Most of the population of 669 is concentrated in the north. The Desert Mounted Corps Memorial stands near the summit of Mount Clarence, the memorial is a 9-metre bronze statue of an Australian mounted soldier assisting a New Zealand soldier whose horse has been wounded. The memorial was erected at Port Said, Egypt. The memorial was funded by the Australian and New Zealand Governments, the memorial was damaged in anti-British riots during the Suez Crisis of 1956. In 1959, the United Arab Republic agreed to send the memorial back to Australia, a copy of the statue was made and this was erected on Mount Clarence in 1964. Federation architecture is the architectural style in Australia that was prevalent from around 1890 to 1915. The name refers to the Federation of Australia on 1 January 1901, the architectural style had antecedents in the Queen Anne style and Edwardian style of the United Kingdom, combined with various other influences like the Arts and Crafts style. Other styles developed, like the Federation Warehouse style, which was influenced by the Romanesque Revival style. In Australia, Federation architecture is associated with cottages in the Queen Anne style. The Coat of Arms, and rising sun, representing a new dawn in the country of Australia, many Federation buildings, both residential and non-residential, are listed on the Register of the National Estate because of their heritage values. Gardens of the period were complex and contained many elements—generally a wider variety of plants than is seen in contemporary plantings, rose arches, wooden lattice fences were used to partition parts of the garden off, particularly the front from the more private back. Garden paths could be straight or gently curved, and often edged with glazed edging tiles or bricks, patterns for brick paving include stretcher bond and basketweave. Asphalt and concrete were not used, plants were selected to produce year-round colour and interest in the local climate conditions. Initially, evergreen trees were used, but the denseness of shade led to increasing popularity of deciduous trees such as jacaranda, flowering plum, palms often framed the garden vista, and the native Cootamundra wattle was popular, as were shrubs such as camellias and standard roses. Conservatories contained begonias and adiantum ferns and they are Federation Queen Anne style, Federation Filigree style, Federation Arts and Craft style, and Federation Bungalow style. The Federation Queen Anne style was designed to embrace the outdoor lifestyles of the Australian people, most homes have asymmetric gables, white-painted window frames, front verandas with decorative timber features, tiling on the patio floor and entry paths. The port city of Bunbury is the third largest city in Western Australia after the state capital and Mandurah. It is situated 175 kilometres south of Perths central business district, Bunbury was first established in 1836, and was named in recognition of Lieutenant Henry William St Pierre Bunbury. The citys administrative area, Greater Bunbury, includes four local government areas, the port of Bunbury services the farming and timber industries of the south west. The original inhabitants of Greater Bunbury are the Indigenous Australian Noongar people, the people hunted and fished throughout the sub-region prior to the first European settlement in the 1830s. The first registered sighting of Greater Bunbury was by French explorer Captain Louis de Freycinet from his ship the Casuarina in 1803 and he named the area Port Leschenault after the expeditions botanist, Leschenault de La Tour. The bay on Greater Bunburys western shores was named Geographe after another ship in the fleet, in 1829, Dr Alexander Collie and Lieutenant Preston explored the area of Bunbury on land. In 1830 Lieutenant Governor Sir James Stirling visited the area and a military post was subsequently established, the area was renamed Bunbury by the Governor in recognition of Lieutenant Henry William St Pierre Bunbury, who developed the very difficult inland route from Pinjarra to Bunbury. Bunbury township was mentioned in the Government Gazette in 1839, in March 1841 lots were declared open for selection. By 1842 Bunbury was home to 16 buildings including an inn, thereafter, a growing port serviced the settlers and the subsequent local industries that developed. One of the industries to open up to cement the importance of Bunbury as a port was the timber industry. Timber logs would be floated down the Collie River to be loaded aboard ships headed to the Northern Hemisphere or to South Africa where the hardwood timbers were used for railway sleepers, in 1884 the Government decided to construct a railway from Bunbury to Boyanup,16 miles long. When the line was completed in 1887, the contractor who had built it obtained a contract to control and work it, the line was eventually taken over by the Government in 1891 and operated with locomotives. Edmund Lockyer, was a British soldier and explorer of Australia. Born in Plymouth, Lockyer was son of Thomas Lockyer, a sailmaker, Lockyer began his army career as an ensign in the 19th Regiment in June 1803, was promoted lieutenant in early 1805 and made captain in August 1805. Lockyer was promoted to major in August 1819 and in August 1824 transferred to the 57th Regiment. Lockyer arrived at Sydney, capital of the British Colony of New South Wales, aboard the Royal Charlotte in April 1825 with men from the 57th, with him were his wife and ten children. In August 1825, Lockyer was asked to lead an expedition to explore the reaches of the Brisbane River. On 2 September, Lockyer sailed from Sydney in the cutter Mermaid, leaving the Mermaid at Brisbane, he travelled in a small boat up the river. Lockyer saw coal in deposits on the banks, becoming the first person to identify coal in Queensland, Lockyer arrived back in Sydney on 16 October 1825, and made a report to Governor Sir Thomas Brisbane. In late 1826, Lockyer led an expedition to claim Western Australia for Britain and he sailed on the brig Amity, arriving at King George Sound on 25 December, with twenty troops and twenty three convicts. This was the beginning of the first European settlement in Western Australia, the military base established by Lockyer was named Frederick Town, renamed Albany, and would become an important deep water port. His interview with two sealers, arrested for crimes against local people, revealed intelligence of Dumont DUrvilles survey of King George Sound, Lockyer had planned an overland journey to the Swan River region in February, but learned that James Stirling had already examined the area. Lockyer was to remain in the settlement until command could be given to Captain Joseph Wakefield, Lockyer returned to Sydney on 3 April 1827, sold his army commission and settled in Sydney. In 1852 Lockyer was appointed serjeant-at-arms to the New South Wales Legislative Council, in September 1854 he was commissioned a captain on the formation of the Sydney Volunteer Rifle Corps, a citizens militia force. George Thomas Temple-Poole was a British architect and public servant, primarily known for his work in Western Australia from 1885. His designs for space and buildings are often identified and preserved by local councils. He held roles relating to planning, the arts. His founding and chairing of committees and institutions included, the Western Australian Institute of Architects, Perth Park, George Temple-Poole was born in Rome, Italy to Louise Mary, née Poole, and John George Temple, a Lieutenant Colonel in the British Army. Pooles father died shortly after the family returned to England following the Crimean War and his mother remarried, altering his surname to Temple-Poole. He was educated at Winchester College in England, Poole designed a series of public buildings that were constructed in and around ports and suburbs of Western Australia during the Federation Period c.1890 – c. While his work was influenced by contemporary British movements, Poole contributed in the development of the Australian architectural response to environment. He provided a unifying style to the buildings as government established its presence throughout Western Australia. His buildings influenced residential and non-residential architecture in the regional centres. Poole was an artist, painting in watercolours and oils and was the founder of the Wilgie Sketching Club and he was a prominent Freemason and member of the Weld Club, an important member of the Perth establishment. In June 1902, Poole ran for parliament, contesting the 1902 Claremont by-election and he placed fifth out of five candidates, polling just 6.5 percent. The discovery and exploitation of gold and other mineral wealth during his period resulted in increased migration, prior to this, the colony states growth was modest in comparison. His designs for were built in emerging towns, sometimes in very remote areas such as the north west of Australia. One of his first projects was Roebourne and its port Cossack, the siting or replacing of courts, police stations and other buildings around the state was occurring at this time, following the establishment of responsible government from Perth. King George Sound is the name of a sound on the south coast of Western Australia. Originally named King George the Thirds Sound, it was referred to as King Georges Sound from 1826, the name King George Sound gradually came into use from about 1934, prompted by new Admiralty charts supporting the intention to eliminate the possessive s from geographical names. The sound covers an area of 110 square kilometres and varies in depth from 10 m to 35 m. and is the site of the city of Albany. The sound is bordered by the mainland to the north, by Vancouver Peninsula on the west, although the sound is open water to the east, the waters are partially protected by Breaksea Island and Michaelmas Island. There are two harbours located within the sound, Princess Royal Harbour and Oyster Harbour, each receives excellent protection from winds and heavy seas. Princess Royal Harbour was Western Australias only deep-water port for around 70 years until the Fremantle Inner Harbour was opened in 1897, the first reported visit to King George Sound by a European was in 1791 by the English explorer Captain George Vancouver. Vancouver named it King George the Thirds Sound after the reigning monarch, the next Europeans to visit the sound were Captain Dennis of the Kingston, and Captain Dixson of the Elligood. Kingston and Elligood were whalers and while there caught three whales, Dixson left an inscribed piece copper plate behind. Matthew Flinders anchored in the sound from 8 December 1801 to 5 January 1802, while he was there, his men found the copper plate Dixson had left. During this time Robert Brown and Peter Good collected samples of over 500 plant species, during the course of their stay the ships naturalist François Péron, collected 1060 new species of shellfish and a large number of starfish from the sound. On 25 December 1826, the New South Wales colonial government brig Amity, under the command of Major Edmund Lockyer, Lockyer named his settlement Fredrick Town after George IIIs second son, Prince Frederick, Duke of York and Albany, but this name never gained wide acceptance. Instead the settlement and surrounding locality were usually referred to as King Georges Sound, on 8 March 1836, King George Sound was visited by HMS Beagle, which anchored there for eight days. Old Forts Lighthouse. King Point, Albany. Caerleon, located in Bellevue Hill, New South Wales, was the first Queen Anne-style home in Australia. It is listed on the Register of the National Estate. Division of O'Connor in Western Australia, as of the 2016 federal election. A container ship leaving the port. The tall building at the centre are the port's administration offices and the Western Australian Maritime Museum is to the right. View of the Esperance CBD, 2012. Esperance is renowned for its white sandy beaches and aqua coloured waters. The Duke of York, painted by Sir Thomas Lawrence, in the uniform of a Field-Marshal, with the mantle of the Order of the Garter, holding his Marshal's baton in his left hand. Final work as government architect, the Royal Mint (1899). Controlled by the British crown until 1970. Recreational beach fishing at Dillon Bay, near Bremer Bay. Fishing, tourism and leisure are significant industries in the Great Southern Region.